That victory helped a young Lady Vols squad improve to 3-0 during a three-game stretch away from home. Prior to Sunday’s triumph, UT went 2-0 to win the Junkanoo Division at the 2018 Women’s Junkanoo Jam in Bimini, Bahamas, on November 22nd and 24th. Stetson comes to Rocky Top on the heels of its first victory of 2018-19, an 80-52 home win over Webber International on Friday night in DeLand, FL. The Hatters are 0-2 in road games and 0-5 away from DeLand including neutral sites this season. Roger Hoover (play-by-play), LVFL Andraya Carter (analyst) and Maddy Glab (sideline) will describe the action for SECN+. For UT home games (after football season has concluded), the Lady Vol Network has a low-power transmitter that makes the game available on the radio at 99.3 FM. The UT-Stetson contest takes place on “WINSDAY.” We’re giving away prizes all game long! Enter to win at the Fan HQ table on the concourse at section 129. The halftime performance will be by XPogo Stunt Team performer and UT student Dalton Smith. Kids 12 & younger can pick up a wristband at the Fan HQ table on the concourse to participate in the pregame high-five tunnel. Wristbands are limited. To purchase discounted group tickets and reserve wristbands for your team, call 865-946-7000. Tickets are available for as low as $5.00 at www.AllVols.com. It’s the Twelve Names of Volidays! This game features the first name of Volidays! If your name is Joy, you will receive a complimentary ticket to the game at the ticket window when you show your ID. Free parking & shuttle service will be available from UT’s Ag Campus. Shuttles begin two hours prior to tip. UT has risen to No. 9 in both polls this week, marking the first time in the top 10 of the AP and USA Today Coaches Polls for the Lady Vols since sitting at No. 10 in the Jan. 22 and 23 polls of last season. It is UT’s highest position since ranking No. 6/7 in the Jan. 15 and 16 polls of 2018. Tennessee is the only school to have both its men’s and women’s teams ranked in the top 10 of the AP Poll this week. Tennessee is ranked No. 3 nationally in rebounds per game (48.7), No. 4 in rebound margin (16.3) and No. 5 in offensive rebounds per game (20). UT ranks No. 5 in steals per game (14.2) and No. 8 in turnovers forced (20.8). Meme Jackson is ranked No. 35 in steals per game (3.2). Point guard Evina Westbrook’s confidence running this team is showing, reflected in 55-percent shooting from the floor, 62-percent accuracy from the three-point arc and a team-leading 15.0 points and 4.7 steals per game. She is coming off a 29-point effort at Oklahoma State on Sunday on 12-of-15 shooting. UT opponents are seeing lots of Green, as in Zaay and Cheridene. Zaay tossed in a career-best 17 points vs. OSU on Sunday, while Cheridene pulled down a career-high-tying 13 rebounds. Zaay was named the SEC Freshman of the Week for her work vs. the Cowgirls. Meme Jackson is an energy-provider for UT on both ends of the floor. She leads the team in 3FGs (14), steals (19) and is second in assists (16) and blocks (4), averaging 12.0 ppg. and shooting 46% on FGs, 41% on 3FGs and 80% on FTs. Rennia Davis missed the season-opener with a foot injury, but she has bounced back as the only Lady Vol to score in double figures in every game she has played. She had 13 vs. OSU on Sunday despite fouling out and is UT’s second leading scorer at 13.6 per contest. Stetson is coached by Lynn Bria, who is in her 11th season at the helm of the Hatters. She is 195-135 at SU and is 348-348 in her 24th season as a coach. The Hatters return three starters and five letterwinners after losing six from last season. SU welcomes seven active players to the roster. Stetson made the NCAA tourney in 2005, 2011 and 2013, the WNIT in 2012, 2014, 2015 and 2017 and the WBI in 2016 and 2018. SU is led by 6-3 forward Sarah Sagerer (12.8 ppg./7.8 ppg. ), 5-6 guard McKenna Beach (12.7 ppg.) and 5-9 guard Addi Walters (10.8 ppg.). Asst. coach Shanasa Sanders was an assistant on the high school team (Ribault H.S.) of UT’s Rennia Davis and Stetson’s Day’Neshia Banks. Stetson was 17-15 a year ago and finished 8-6 to place third in the Atlantic Sun Conference and earn a WBI postseason berth, where SU suffered a 49-33 first round loss to South Alabama. 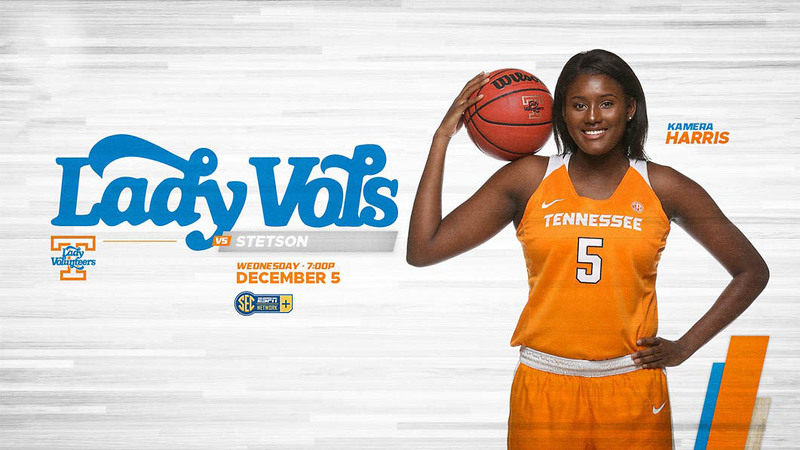 Wednesday night’s match-up between Tennessee and Stetson will be the seventh meeting between these schools and the second between Holly Warlick and Lynn Bria. UT is 6-0 all-time vs. the Hatters (Warlick is 1-0), including 5-0 at home and 1-0 at neutral sites. Tennessee has scored 90+ points in five of six previous meetings, including 112 in a 112-39 outcome on November 26th, 1989. Tennessee legend (1985-89) and current Lady Vols assistant Bridgette Gordon hails from DeLand, FL, where Stetson is located. The Lady Vols are 10-0 all-time against schools from the Atlantic Sun Conference. UT had a 100-60 win over ASUN opponent Liberty in last season’s NCAA First Round in Knoxville on March 16th, 2018. Redshirt sophomore Diamond DeShields scored 30 points, leading UT to a 90-56 win over Stetson in Knoxville on December 30th, 2015, the last time these programs met. Te’a Cooper tallied 13, Jamie Nared 12 and Mercedes Russell 11. All 12 of Nared’s points came in the second half of that game. The Lady Vols rushed out to a 24-14 lead after the first quarter, but the Hatters held strong to match Tennessee 17-17 in the second period, giving UT a 10-point halftime edge. Sophomore Evina Westbrook poured in a career-high 29 points to lead No. 11/11 Tennessee to a gritty 76-63 road win Sunday over previously-unbeaten Oklahoma State at Gallagher-Iba Arena in Stillwater. Sophomore Rennia Davis and freshman Zaay Green also hit double figures for UT (6-0) with 17 and 13, respectively, with Green posting a new career high. Cheridene Green was a presence on the boards, pulling down a career-best 13 rebounds. The Cowgirls (6-1) were led in scoring by Braxtin Miller, who finished the day with 29 points. With Tennessee trailing 43-40 at the break, Westbrook kicked things off in the second half, knocking down a three on UT’s first possession to ignite a 19-3 run that put the Lady Vols up 59-46 with 3:43 left in the third quarter. The Cowgirls chipped away at UT’s lead to start the fourth stanza, pulling within five by the 4:18 mark. Zaay Green and Cheridene Green hit back-to-back buckets, however, to turn the tide for the Lady Vols and extend UT’s lead to 70-61 with 3:20 left in the game. OSU answered with a pair of made free throws, but Westbrook dropped another six points and Tennessee sealed a 76-63 victory. Stetson scored a season-high 80 points and tied a school-record with 14 made 3-pointers in an 80-52 win over Webber International Friday afternoon at the Edmunds Center in DeLand, Fla.
Addi Walters led four players in double figures with a season-high 21 points as the Hatters (1-6) notched their first victory of the season. Stetson went 14-for-35 (.400) from behind the arc as six different players hit threes. Walters drained five long-range shots, while Sarah Sagerer and Bianca Fizouaty hit three apiece. Sagerer finished with 17 points, nine rebounds, five assists and five blocks. Fizouaty had season highs of 15 points and three steals for SU. After the Stetson game, Tennessee travels to Austin on Saturday, where the Lady Vols will face off Sunday against #12/12 Texas at Noon CT (1:00pm ET) in the Frank Erwin Center. The game will carried by ESPN2.